People gazed at the sky in wonder and cheered while others knelt in prayer as a total eclipse of the sun unfolded over Indonesia on Wednesday. PALEMBANG, Indonesia (AP) — People gazed at the sky in wonder and cheered while others knelt in prayer as a total eclipse of the sun unfolded over Indonesia on Wednesday. The rare astronomical phenomenon was witnessed along a narrow path that stretched across 12 provinces encompassing three time zones and about 40 million people. 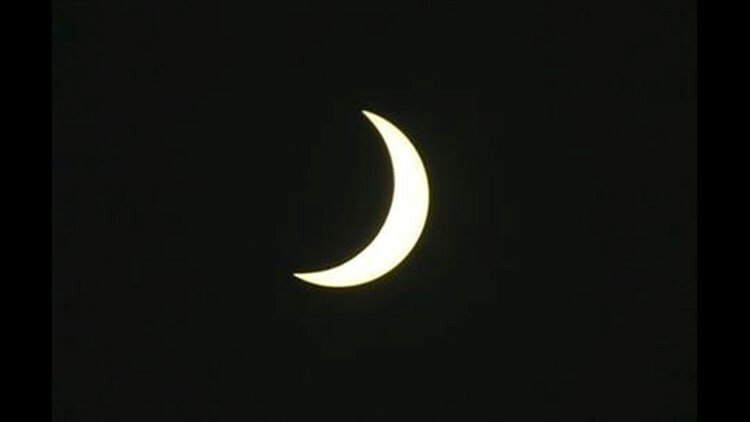 In other parts of the Indonesian archipelago and Asia, a partial eclipse was visible. Thousands of eclipse-chasers came from abroad and the government, which has been the promoting the event for more than a year, forecast a substantial tourism boost. Some tour groups chartered ships to view the eclipse, which began in the Indian Ocean, at sea. Thousands of men, women and children gathered in Sigi Biromaru, a hilltop town of Central Sulawesi province, shouted and clapped as the sun transformed into a dark orb for more than two minutes. Hundreds of others prayed at nearby mosques. "The sun totally disappeared. How amazing this sunny morning suddenly changed to dark," said Junaz Amir, a Sigi resident who witnessed the eclipse with his family using special glasses that protect the eyes. Most eclipses are partial but when the moon is close enough to the Earth, the sun is completely eclipsed by the moon's shadow and only a faint ring of rays known as the corona is visible. The previous total solar eclipse was in March last year and was best viewed on Norway's Svalbard islands near the North Pole. The next total eclipse will occur in August 2017 and be visible over North America. "I'm so happy that I can see this rare phenomenon in my life," said Nurjanah Hassan, a mother of three in Ternate in eastern Indonesia, one of the last cities in the eclipse's path. Hassan said she and other residents use bowls filled with water to view the eclipse. Experts say the total eclipse can be viewed with the naked eye but filters should be used during its partial phases to avoid permanent damage to the retina. The entire eclipse, which began with the first patch of darkness appearing on the edge of the sun, lasted about three hours. For the viewer, the length of time the sun was totally eclipsed depended on their location along the path. The moments in which the sun was entirely eclipsed lasted between 90 seconds and 4 minutes though on land the durations were mostly between 1 and 3 minutes. In the capital Jakarta, thousands of residents packed a planetarium at a downtown park where officials distributed about 4,000 filtered viewing glasses. Cloudy skies in parts of Indonesia dampened the spectacle for some. "It is now dark here, but unfortunately, we cannot see the sun. It is totally covered by clouds," said Hery Gus in Bengkulu, a southwestern province of Sumatra. Scientists from NASA and Indonesia's aerospace agency observed the eclipse from Maba in the Maluku islands. Wright reported from Jakarta. Ali Kotarumalos and Niniek Karmini in Jakarta, George Rajaloa in Ternate, and Abdy Mari in Sigi Biromaru contributed.